On my vacation to Chandigarh , Amritsar ,Dalhousie and Dharamsala. I got a chance to visit the famous Golden temple. This Temple is the must visit place in Amritsar. The Golden Temple, located in the city of Amritsar in the state of Punjab. It is the best spiritual place in the country. The name "Golden Temple" comes from this gold-plated building. Visitors to the Temple must remove their shoes and cover their heads before entering the temple. 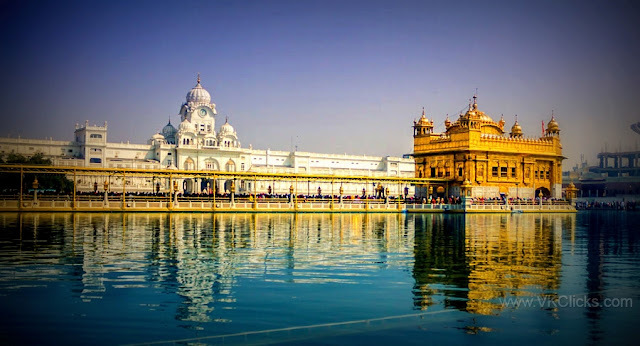 In Golden temple Don't miss Langar, which is a community kitchen where each day around 100,000 people are fed by temple volunteers regardless of colour, creed, caste or gender. Everyone is welcomed and invited to join the Langar where -- a simple and unlimited meal of chapatis and dal is served. Excellent pic. Hope to see it in real some day.